1. Governments and water professionals in the Danube region are facing a combined challenge of meeting their citizens’ demand for universal, good quality, efficient, and financially sound, or in a word, sustainable, services, while catching up to the environmental requirements of the European Union acquis communautaire. As this report shows, much work remains to be done to provide sustainable water and wastewater services for all in the Danube Region, in particular among recent or future EU members. Millions in the region do not have in-house piped water or a flush toilet, with the bottom 40 percent and poor, rural, and minorities overrepresented. Some service providers still struggle to provide continuous, potable water to their clients; low tariffs and inefficient utility practices create challenges for the proper operation and maintenance of the existing infrastructure. At the same time, to satisfy the acquis communautaire, the Water Framework Directive is being transposed into the legal and institutional frameworks of the countries of the region, and large investments for the upgrading or development of water and wastewater assets are being made, which create further technical and financial burdens on service providers. Governments around the region are therefore revisiting the way services are being delivered and financed, and this State of the Sector review seeks to document and inform the process by showing how policies focused not only on EU compliance, but broadly on providing universal, high-quality, efficient, and financially sound services to all, including the poor, will help meet the spirit of the EU acquis communautaire and citizens’ expectations in a sustainable and equitable manner. 2. The State of the Sector report analyzes the region’s progress and challenges in delivering sustainable water and wastewater services for all. The Word Bank’s twin goals are to eliminate extreme poverty and increase shared prosperity, and water services play an important role in achieving those goals. The report therefore focuses particular attention on understanding the situation of the bottom 40 percent of the population (with respect to income), and on the extreme poor living on less than $2.50 a day PPP. While some of the information is available only for services provided by utility companies, the report aims to cover the entire population, including rural areas. 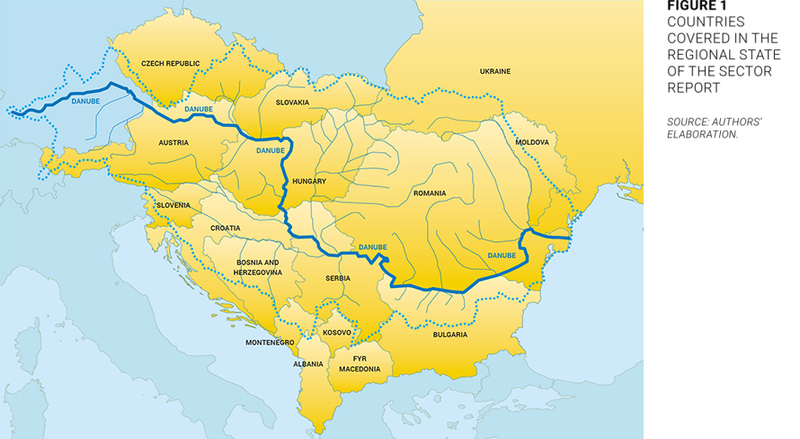 The review covers 16 countries contained within or bordering on the Danube watershed (Figure 1), which represent a great diversity of socioeconomic, development, and geographic realities, but share a joint resource, the Danube; an intertwined history; and a common trajectory toward European integration. Given the relevance of the EU accession process for water services, the report presents many of the results separately for EU members, EU candidates (including potential candidates), and Non-EU countries. The report is a flagship product of the World Bank / International Association of Water Supply Companies in the Danube River Catchment Area (IAWD) Danube Water Program (www.danube-water-program.org), which provides parallel support to many of the region’s stakeholders to achieve smart policies, strong utilities, and sustainable services. 3. The analysis assumes that the delivery of sustainable services depends on four main dimensions: access infrastructure to be in place, service providers to operate and maintain it, sector governance that helps those thrive, and the proper financing mechanisms to maintain and expand services in the long term. Before describing those four dimensions, Chapter II highlights the context in which services are being delivered; Chapter III provides an overview of the organization and governance of the sector in the various countries; Chapter IV describes the level of access to water and wastewater services in the region; Chapter V deals with the performance of service providers, in terms of service quality, efficiency, and overall performance; Chapter VI discusses the financing of services; and Chapter VII presents conclusions. A number of boxes provide additional information on good practices or key concepts. The report includes two annexes; the first (Country Pages) offers a comprehensive, country-by-country list of indicators; and the second (Methodological Notes) provides further methodological details on the main sections of the report. The report also includes a comprehensive list of sources for all data and information used throughout the document. The report is complemented by 16 Country Notes, which provide greater details on the State of the Sector in each country. All material are also available online on the sos.danubis.org website. Further information is also available on the www.DANUBIS.org water platform, an online repository of resources for and about water and sanitation services in the Danube region. 4. This report and the State of the Sector review is the result of a team effort of more than 30 contributors spread over the entire Danube watershed and beyond, and builds largely on publicly available data and the collective work of many institutions in the region, including line ministries, regulatory authorities, and national waterwork associations. The report draws largely from existing, public data sources at the national and regional levels, although it represents the first time those various sources have been consolidated into a coherent, regional narrative and analysis. In-country data (referred to as “SoS data collection”) were collected by a team of local consultants in each of the countries covered by the report, and validated with key stakeholders in each country. To keep the main text readable, many of the references have been moved to the end of this report, along with some of the methodological descriptions. The national data were complemented by publicly available household survey data in each country, as well as regional resources such as the EU’s EUROSTAT, the FAO’s AQUASTAT, the World Bank’s World Development Indicators, the European Environment Agency’s (EEA’s) WISE, the WHO/UNICEF Joint Monitoring Program, and the IBNET / DANUBIS database. While preparing the report, assumptions were made, and although an extensive validation effort was undertaken, it is to be expected that some of the data and information provided could be questioned. The report’s preparation has also shown that some countries have much better information than others, and sometimes official statistics do not reconcile fully with the reality that sector professionals know. The team therefore welcomes comments and corrections. 5. While great care has been taken to ensure consistency and accuracy of the data and information, the main aim of the report is to support an informed dialogue around the sector’s challenges rather than provide a definitive set of policy recommendations. This report, by itself, will not solve the challenges highlighted in the last chapter. By design, the report is limited to an analysis of the current situation, and does not include formal policy recommendations for the region or the individual countries. National stakeholders are best placed to discuss whether and how to address them, drawing on the analysis provided in this report, and the opportunities and good practices described throughout the document and in its supporting Country Notes. It is the authors’ hope, however, that this report will provide a solid information and analytical basis to inform the necessary dialogue, despite any limits and shortcomings in the data available and the resulting conclusions. The authors will gladly provide any necessary support to this process, and hope that the next edition of this State of the Sector Review will be able to build on a much stronger database and document progress in addressing the sector’s main challenges.